Utilizing a pneumatic, normally closed diaphragm valve, Dymax Corp.'s Model 475 valve dispensing systems accurately dispense low- to high-viscosity fluids. The design of the internal diaphragm and adjacent parts prevents migration of fluid into the actuating section within the valve. The toughness of the diaphragm, along with the selection of appropriate materials for component construction, ensures long diaphragm and valve life between maintenance schedules. These features make these valve systems suitable for dispensing light-curable materials and such reactive materials as cyanoacrylates, anaerobics, and solvent-based products. Accurate, repeatable performance is achieved by using the valve's stroke adjustment knob to dial in a desired shot volume. And a 25-µm air filter regulator permits only clean, dry, particulate-free air to pass, ensuring the system's long and continuous life. The regulator includes an integrated shutoff valve and pressure exhaust to quickly and safely depressurize the system, eliminating the need for the operator to open and close the regulator. The AC200 benchtop adhesive dispenser employs dual-barrel cartridges to dispense adhesives with precision. Available from Ashby Cross Co. as an alternative to handheld systems, the 12 × 12-in. system features a pneumatic dispensing gun that is operated by a foot pedal. Several versions of the dispenser are offered to suit the user's repeatability requirements. Manual, timed, or digitally controlled electronic encoders provide accurate, repeatable shot control. Systems can be supplied to suit dual-barrel adhesive cartridges of any size and ratio. The dispenser is designed for use in applications requiring accurate shot sizes in low-volume processing operations. 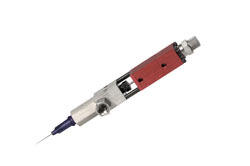 Used in medical device applications, the Loctite AssureCure system is an in-line unit designed to quantitatively assess the degree of cure of light-curing adhesives. Available from Henkel Corp. and easily integrated into production lines, the system features fiber-optic light sources, a light detector, and software that communicates with the user's PC or PLC. Because it is capable of confirming cures at a speed of 20 milliseconds per part, it can check 100% of production output, according to its manufacturer. Meeting the biocompatibility requirements of ISO 10993, the system is an alternative to destructive off-line testing and prevents the generation of scrap. It features a small footprint and can be positioned directly downstream from a production line's existing light-curing station. The fully programmable VMP electronic variable-displacement metering pump accurately dispenses ultraviolet (UV) radiation-sensitive fluids, including UV-curable assembly adhesives. Available from Fluid Metering Inc., the dispenser features a precision stepper motor that controls the pump speed and employs the manufacturer's patented CeramPump valveless piston pump design. Made of Type 316 stainless steel or opaque PVDF, its pump head keeps UV light from affecting process fluids in transit. A second stepper motor electronically adjusts the piston displacement; by varying the length of the piston stroke, dispense quantities can be finely tuned. This dispenser can be programmed for a variety of functions via a user-friendly touch screen interface that can control up to 16 pumps on a single bus; up to 128 metering devices can be controlled using a PLC or computer. Featuring a slim design, high resolution, repeatability, and a dispense volume range of 0.0015 to 0.016 cm3 per cycle, the MV200 positive-displacement valve can handle a variety of fluids. Provided by PVA, the valve can dispense ultraviolet adhesives used to bond plastic, glass, and metal medical device components. 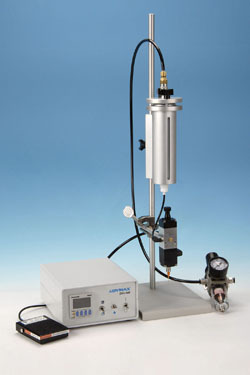 It meters fluids volumetrically through the displacement of a mechanical rod. Dispense volume is always determined by the operator's mechanical setting and cannot be altered by changes in fluid viscosity, fluid pressure, temperature, or any other condition. The fluid-contacting portion of the 160 × 19 × 19-mm 8-oz valve is constructed entirely from FDA-approved Type 300 stainless steel, Teflon, and Kalrez. The valve can be employed as a handheld manual device or integrated as multiple close-set valves in space-restricted areas of high-volume automated production lines.